According to “The Digital Journey to Wellness,” a Google and Compete Inc. hospital study, 77% of patients used search engines and 83% used hospital sites before booking an appointment. In today’s digital world, prospective patients are now ACTIVE PARTNERS in their medical journeys. If you are a part of this journey, you will be able to increase patient acquisition for your hospital. This creates a huge opportunity for you. Hospitals are in an inevitable position with lots of in-house experts, as well as a hungry audience eager to research a vast amount of health-related topics. Many healthcare organizations have expanded their priorities from simply growing their online and social media presence to actually engaging with patients and consumers on various platforms. And there’s arguably no better engagement tool than video marketing. Video can connect and educate while humanizing the organization. Videos are highly effective when utilized across the patient journey. Here are some examples of video types with each aligned stage. What types of videos should you create to increase patient acquisition? We have mapped them below and aligned them with the buyer stages. We’ve also included some video best practices so that you can get the most out of your produced video. It’s important to connect with consumers before they have health care needs. You can do this organically by having your video rank on a search engine, and found by consumers seeking healthcare information online, or can be pushed out via a paid online campaign. The goal of the following types of videos is to get on the consumer’s radar and to start developing credibility and trust. Preventative Healthcare Topic Videos: Cancer, heart disease, weight loss, nutrition, mental health featuring in-house experts that include short digestible vignettes. This will position you as the authority for medical help and will help increase patient acquisition. Video Distribution: Shared on social media, organization’s website, blog or e-newsletters, encouraging consumers to sign up to receive via email. Providing information on recent advancements in medicine for patients positions you as an authority on medical care. It will position you and your staff as leaders in technology for prevention, detection, intervention, therapy, and wellness. Your potential patient is researching a specific health problem or current need; this could be anything from symptoms to test results to a diagnosis. The goal of the following types of videos is to provide helpful information that demonstrates credibility and expertise. This is critical information that a patient needs now, without this content you could lose this new patient acquisition. Video Distribution: Published on a hospital patient resource section, aligned service line web page, blog, e-newsletters, and sent to incoming potential patient inquiries. Of the one in eight patients who watched an online video, 56% watched to learn about complicated treatments and procedures. Use the Health Topic Research Education videos by editing them into shorter 30 to 60-second videos more suitable for social media, and put a small paid social media campaign to share your content with your target audience. Video Distribution: Paid social media campaigns. This is the decision-making stage where patients have done their research about the problem and different treatment options, and now they are searching for a healthcare professional or organization who can provide the care they need to solve their health problem. The goal of these videos is to entice your potential patients to take action. Videos should demonstrate why your organization and team are best to care for the patient. This is the last stage of patient acquisition journey. Let a patient—an objective, third party—talk highly of your hospital instead of someone in-house. A first-person patient success story could be your best approach in connecting and resonating with prospective patients. Of the one in eight patients who watched online video (Google/Compete Inc. study), 43% watched a patient testimonial. Video Distribution: Aligned service line web page and social media. Use short, two- to three-minute videos to highlight your specific areas of service (cancer, orthopedics, cardiology, etc.). This is your opportunity to demonstrate key benefits and expertise, as well as visually feature happy patients, staff and your facility. Video Distribution: Aligned service line web page and sent to incoming potential patient inquiries via email. Create short 30 to 45-second video ads that target people who are looking for a health care solution now. The video can demonstrate your organization’s expertise and key differentiators in solving the health care issue. Don’t use YouTube as your video player if you want visitors to come to your website through an organic search. Instead, use a third-party player like Wistia. Keep your patient acquisition videos short, preferably one to two minutes, and three minutes max. Publish an audio transcript with your video so search engines can find your video for search ranking. Try to avoid a static “talking head” in your educational videos, which is likely to quickly lose the viewer’s interest. Instead, use b-roll video or motion graphics for better viewer engagement and to reinforce key points. Boost organic reach of your video by using the best keywords for a specific topic via talking points from your featured participants or in the voice-over script. For videos designed to convert consumers, create a landing page on your website with strong supporting text and a measurable call to action. 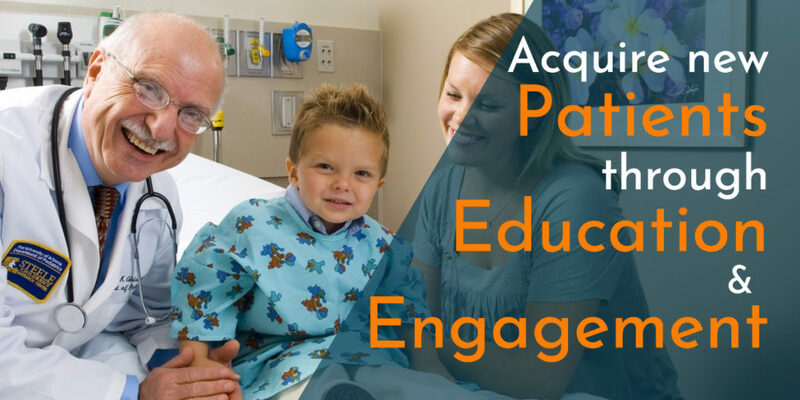 By providing education on engaging topics, you will be able to raise awareness and increase your patient acquisition. Don’t hide behind the text, use video to show your personality and connect with your audience. If you need help choosing the right videos, we’re here for you.